Our Cumbrian Lakes Villa Features a saltwater pool. The salt water chlorination produces clean, clear, silky-smooth water that’s luxuriously soft. It is also a continuous natural sanitization method, in contrast to administering harsh chemical chlorine to the pool once a week as is done 95% of the time in Central Florida. This means a steady supply of chlorination instead of a weekly “shock” and a low chlorine state by the end of the week. Saltwater pools offer a pleasant healthful swimming experience with fewer chloramines produced; eliminating the harsh chemical odor. Salt water pools reduce skin and eye irritation and greatly reduce the chlorine smell you probably have experienced if you have ever rented other homes in the area. We certainly hope you rent with us, but no matter where you decide to rent, please consider researching saltwater systems before you make your decision. A Salt Water pool will enhance your swimming experience. Cumbrian Lakes Villa continues the high standards you have come to expect from Reed Investment Properties. 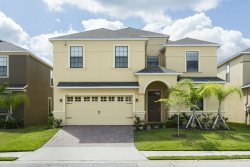 This 6 bedroom, 3.5 bathrooms Villa is located in Kissimmee, Florida, a 10 mile drive from Walt Disney World! Designed with you in mind, Cumbrian Lakes Villa includes everything you will need during your stay. Like all Reed Investment Properties, Cumbrian Lakes Villa has its own private pool. Cumbrian Lakes Villa is a 6 bedroom / 3.5 bath vacation villa that sleeps 14 people This rental in the Cumbrian Lakes gated community is huge, with an impressive 2650 square feet divided among two floors. On the first floor a spacious family room off the kitchen is equipped with a 50" HD television, Xbox and Blu-Ray player. The kitchen is connected to the family room includes all the necessary appliances to prepare your meals right in your home away from home along with a breakfast nook. The formal dining room and living room allows for guest to spread out in another area. The kids can enjoy the game room which contains Foosball, a pool table and an arcade. One queen sized bed with access to the pool area and one themed Mickey Mouse Room with 2 twin beds are located on the first floor. These bedrooms share a bathroom located between them The second floor contains 4 more bedrooms. Two of the bedrooms contain king sized beds with large flat screen TV's. The master bedroom has a king along with an ensuite bathroom with a walk in shower, bathtub and two sinks. The remaining other bedrooms containing a King size Bed, a Full size Bed and a themed Harry Potter bedroom with two twin beds. These rooms share a bath. The laundry is right off the kitchen. Cumbrian Lakes is a 120 acre conservation area and nature trail. The gated community is perfectly suited for long walks, a quick soccer game, a little energy release at the children’s park or for the sportsman in you, try your luck fishing. (fishing permitted without permits). It is the perfect setting for total relaxation after a tough adventure to the many theme parks located within 15 minutes of our beautiful home. All properties we advertise are owned and maintained by us. We are not a property management firm nor do we utilize a property management firm. We are a small family owned business. This fact insures you will receive a uniformly stocked, clean and well cared for home for your visit. Most homes are rented by a management company that may have limited motivation to care or look after the home. This is not the case with us. The houses you book will be the actual house you will stay in on your vacation with us. No house swapping here. As we own our homes when you book, you are guaranteed to stay in the house you choose. All villas have a game room with a combination of different forms of entertainment like a pool table, Foosball, air hockey, arcade style games. Each house has different games; please contact us to see what options are in each home. All homes have a XBOX 360 free to use during your stay in addition. You are on vacation with us and we want you to have fun. A grill is at each house and is free to use but you are responsible for propane on certain homes. Most other homes charge for using the grill and also the amount of propane you use. A secured internet connection is at each villa and is free to use. Many other homes charge for WIFI. Reed Investment Properties adheres to the same cleaning standards as most 5 star hotels. Our comforters are outfitted with duvet covers and are washed every time between guests along with the rest of the bedding. You can rest assured that our bedding is clean and fresh. Most other homes may wash their comforters once a year. If you do not rent from us make certain you ask the person you are renting from what their bedding cleaning policy is. This home has a cleaning fee of $140 plus tax. The prices above reflect only the cost of the home. Below are the most popular options to a home rental and can be added at any time. Spa Only Heating: $15.00 per day. Pet Fee: $100 for one dog, $50 additional each for the second and third with a maximum of 3 dogs. Damage Deposit: Two Options $50 nonrefundable or $250 refundable, both give you $250 in coverage. All house information will be sent one week before arrival. Set in a quiet and attractive conservation area with lakes, cycling and walking trails and children’s play area, the villa backs onto protected conservation woodland. Cumbrian Lakes Resort is an exclusive, gated community, less than 15 minutes from the Disneyland Florida parks, 20 minutes from Universal Studios and only 5 minutes from the heart of the bustling ‘Highway 192’ area, with a wealth of shops, restaurants and other attractions. However, once you enter the resort, you will appreciate the peace and calm of this superb location. © 2019 | Reed Investment Properties - All rights reserved.